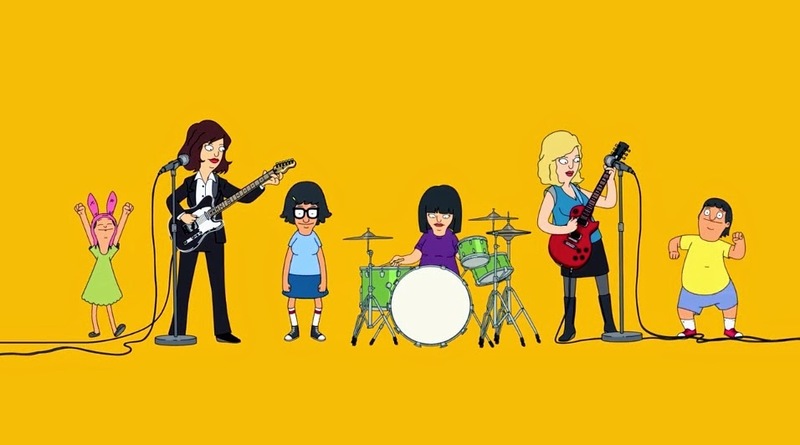 If It's Too Loud...: The New Sleater-Kinney Video Features "Bob's Burgers"
The New Sleater-Kinney Video Features "Bob's Burgers"
Two of my favorite things collide in this new video for Sleater-Kinney's "A New Wave," which features the kids from Bob's Burgers furiously bopping away as they discover the band in oldest sister Tina's bedroom. Bob's Burgers is one of the few tv shows I watch religiously, and Sleater-Kinney's new album is my favorite of the year so far, which makes this video spectacular. It also perfectly captures the excitement and sheer joy of discovering that very first band that speaks to just you in a way that no other band ever has you can only get in your teen years, all in cartoon form. You can watch the video for "A New Wave" below. Check out Sleater-Kinney's website where you can order their new album (which, if you haven't yet, shame on you) and see tour dates for their virtually sold out reunion tour with sadness because you waited 8 hours to buy tickets and it sold out. Or maybe that's just me.